Extortion vs. Blackmail – What’s the Difference? Home » Extortion vs. Blackmail – What’s the Difference? Do you know the difference between blackmail and extortion? Unless you are a mafia enforcer, the difference probably isn’t germane to your everyday life, but you might still need to know the difference so that when someone else commits one of these crimes, you will be able to sound intelligent and well-informed while discussing it with your friends and coworkers. In this post, I will compare blackmail vs. extortion and use each in several example sentences to give you an idea how each word should appear in context. Plus, I will show you a helpful memory tool that makes choosing blackmail or extortion a little easier, at least for writing purposes. What does extortion mean? Extortion is a noun. It refers to the practice of obtaining something through illegal means, like brutality or coercion. Extortion can also mean illegally using one’s elected office for personal gain. Below, you will find examples of extortion in a sentence. The mobster’s many talents included extortion, murder, money laundering, and smuggling. The mayor made headlines for all the wrong reasons when he was convicted of 36 separate counts of extortion. Extortion should be distinguished from bribery. Bribery means illegally offering something in exchange for preferential treatment. If you engage in bribery, you offer someone something good, like a sum of money. If you engage in extortion, you threaten someone with something bad, like killing a family member. What does blackmail mean? Blackmail can be a noun or a verb. As a noun, blackmail traditionally means the act of threatening to release damaging information about someone unless they give you money. In practice, though, many people use blackmail in such a way that it doesn’t necessarily involve a monetary payment. A common sitcom plot involves one character threatening to reveal another character’s dirty secrets to get them to do something nice for them, or even for a third character. Ken got plenty of dirt on Jamie the night they got drunk together, which he now uses for blackmail. Blackmail is considered a crime in most places. Blackmail can also be used as a verb, where it refers to engaging in the activity described above. Kelsey blackmailed Frances into doing her laundry for an entire month. Edward is a bad boss; he has been known to blackmail his employees into giving up their vacation days. Today, the way many people use blackmail is akin to a type of extortion. Classically, though, blackmail refers to a threat of releasing damaging information in exchange for a monetary payment. Extortion is getting someone to do what you want by any of several illegal means, like violence or abusing an elected office. Extortion vs. Blackmail Check: Since blackmail and information both contain the letter I, it should be easy to remember that blackmail involves damaging information. Is it extortion or blackmail? Both of these practices are illegal, but they refer to different acts. Extortion means using illegal methods to get someone to do what you want. Blackmail is a type of extortion that involves threatening to divulge damaging information for a monetary payment. 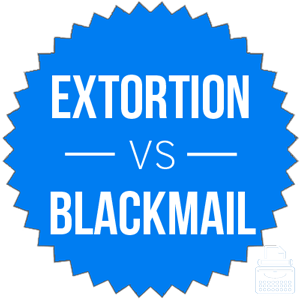 1 What is the Difference Between Extortion and Blackmail?